I was coming back from Ireland on Virgin Airlines. While we were there we partied like rock stars, drank too much, got no sleep and danced in the rain. Needless to say, I caught a head cold! On the plane, my head was pounding, my body was aching and the stewardess could tell I was hurting. We were looking at a ten hour flight back home and the way I felt, I knew it was going to be a painful ride. “I’m dying a slow, painful death,” I answered. Sure I was being a little dramatic, after all, I am an Aries and a Latina woman who grew up on Telenovelas and drama is my middle name. I explained to her that I had a bad head cold. I was already powerless from her accent and the fact that I love Irish whiskey, so I didn’t need any convincing. She brought me a hot cup of what appeared to be tea. I took one sip and it was so soothing. My body ache slowing went away and I was able to breathe a little better. Of course the more I drank, the better I felt. It tasted so sweet and delicious, I just couldn’t help myself. I kept ordering one after the other, like the the boy in the story Oliver Twist. “Please sir, may I have some more.” She gladly brought each cocktail to my seat and was tickled that I was enjoying them so much and already feeling better. So now I’m drunk, sleepy and curious. Did she say her grandmother made these for her when she was only a girl? I need to ask her more about this soothing drink, but my curiosity would have to wait because I soon passed out. How does this magical Irish home remedy work? A good whiskey will help you rest and get some shut eye. And quite frankly, sleeping is what makes you heal faster when you’re sick, so feel free to sleep away that head cold or flu. Warning: Drinking one Hot Toddy or two will make you feel better, but don’t go overboard. If you get drunk the way I did, your immune system will suffer and can work against you. Therefore, you might want to stick to one or two. 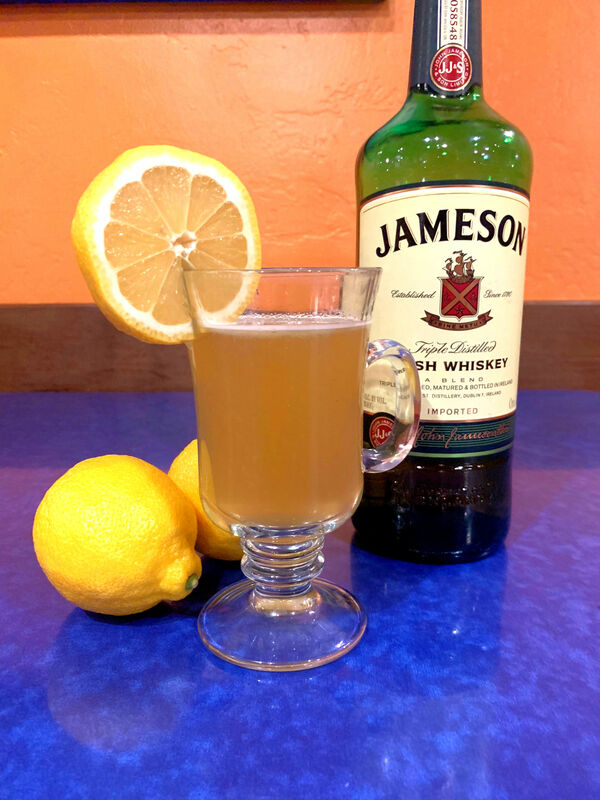 Next time you’re feeling a little under the weather, try making this recipe at home and think of that sweet Irish airline stewardess’ auntie who took time out of her day to make her dying, baby niece a hot toddy. I will always remember the beautiful Irish stewardess, now a grown woman, who took pity on me once upon time. Mix lemon juice, honey and whiskey. Top with hot water and stir. Garnish with lemon wheel but that’s optional. Sometimes we don’t want to get fancy when we are feeling a little ill.
Share your photos with the hashtag #ChefRosie. I would love to see what you’re making!